In this tutorial we will show you how to create a photo slideshow. A Photo Slideshow consists of photographs that you put together. Slideshows usually have a theme to them, like my travels to Africa. With todays technological advances it’s possible to add music and different effects to enhance your slideshow and make it more appealing and fun. When creating a photo slideshow, let your imagination reign, implement different transition effects when gathering your slides, add music and your slideshow will become original and expressive. Photo Slideshow Software offers its users the ability to combine their memories with music that complement and accentuate your photographs. When adding music one need to remember that music adds feeling to your photographs. Music sets the mood of your photo collage, it transfers the viewer to those moments it time and allows the viewer to co-experience those memories with the slideshows creator. The photo slideshow you create can become your virtual photo album that can duplicate and send to your friends via e-mail, or by posting them to websites like YouTube or Facebook. Let's take a look at some of the steps we need to take in order to create a photo slideshow. 1. Using Photo Slideshow Creator from AMS Software. This program contains necessary functions to prepare a vivid and memorable slideshow. 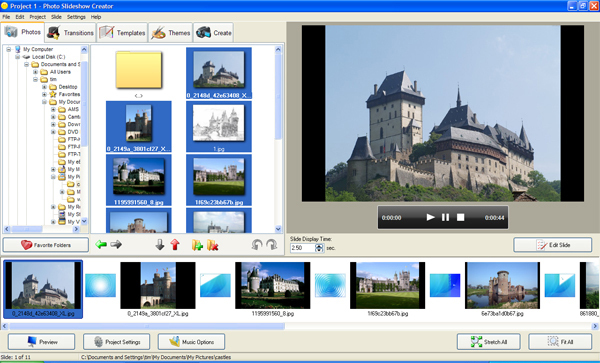 You select the images to display, add background music, use labels, and create DVD, AVI, MP4 video files. The program also allows you to view your work before you publish it, thus allowing for easy editing. The slideshow editor includes an extensive catalog of decorative frames and screens for slide design. You can add background images, change the font style and add text. This program contains many different selections of transition effects between photos thus giving your slideshow a professional look. 2. Slideshow Duration. The timing of your slide show depends on the number of images. For optimal perception, your slideshow should contain 12 to 20 slides per minute. When adding music to your slideshow the Photo Slideshow Creator program will allow you to synchronize your music time with your slides. 3. Selecting Photographs. If you want your slideshows to look professional then use only high quality images, the clearer the picture the nicer it looks. Quite often we have interesting pictures that may require some photo enhancement. When photo editing is required you can use another AMS Software program Home Photo Studio that will allow you to edit your photographs. Home Photo Studio offers such editing tools as, picture resizing and cropping, brightness and contrast adjustment, color correction, retouching, adding effects and much more. 4. Choosing a Theme. A successful slideshow will always have a theme to it. One must consider the slideshows theme in advance, prior to creating the actual slideshow. 5. Titles and Labels. Titles perform first and foremost an informational function, it tells the viewer what they are about to view. Label inscriptions in the slideshow can highlight comedic or romantic moment, focus on specific details. When using labels one should not overdue it, since this may hinder viewers perception and simply become an annoyance. 6. Selecting the right Music. You should pick out your music before you begin to create your slideshow. Music will make your slideshow more memorable, it gives warmth and makes the slideshow experience more personal. Selecting the wrong music can produce negative and unattractive results. When creating a slideshow with music, take a responsible approach in your music selection. It is very important that your music coincides with the theme of your slideshow thus the music will be able to increase emotions and create a proper atmosphere. 7. Finishing the Slideshow. This is the final step in our how to create a photo slideshow tutorial. Use the previously mentioned materials above to create a beautiful and impressive slideshow. There’s a variety of decorative elements for your slides to choose from, like transitional effects between slides. Practice makes perfect, don’t be afraid to create different slideshows, with time you should be able to increase your skills in slideshow making and become quite good at it.